The Jordan Pond House in Acadia National Park is justly famous for two things: its popovers (gotta be eaten to be believed) and its view. Lunch or dinner on the Jordan Pond House lawn (seating for a hundred or more at tables with individual umbrellas), on any day when it is not actually raining, is, like the popovers, an experience not to be missed. 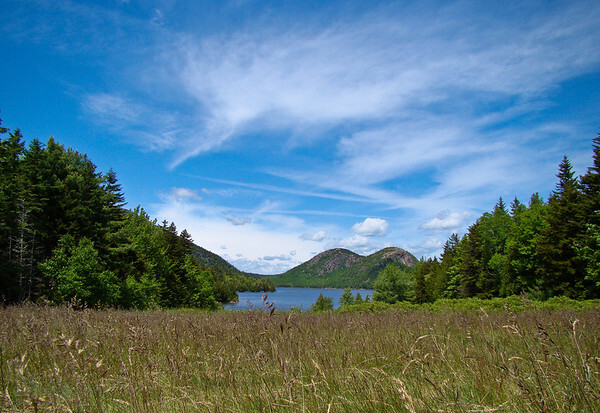 Jordan Pond stretches away below the lawn and the blueberry patch and the Bubbles (two smallish mountains by Acadia standards…big rocks by western standards), rise up behind. Weather comes down the deep valley of Eagle Lake behind the Bubbles and makes for interesting skies. Scenic or what. I have photographed the Pond and Bubbles in just about every light, at different times of year, but this is actually the first image I have taken from the vantage of the lawn. I was actually sitting on the ground a the edge of the lawn when something about the sky and the bit of weedy grass in the foreground just caught my attention this trip and I took 10 or more exposures at various heights above the ground (between on it, and a foot off it) in an attempt to capture the depth of the view. The low angle was also necessary because there were people continuously walking down a path that runs along the trees on the left, below this near horizon, and people on the path along the lake at the foot of the hill. This shot works for me. You will see some other treatments of this view in coming days. Sony DSC H50 at full wide. F5.6 @ 1/500th @ ISO 100. Programed auto. In Lightroom, I used Recovery for the sky, moved the blackpoint to the right slightly, and added both Clarity and Vibrance. I added a bit of contrast, and used the Landscape sharpen preset. From Mount Desert Island and Bar Harbor 2009.